Windows 10 comes with new versions of the built-in Photos, Music or Groove, Maps, Movies and TV. 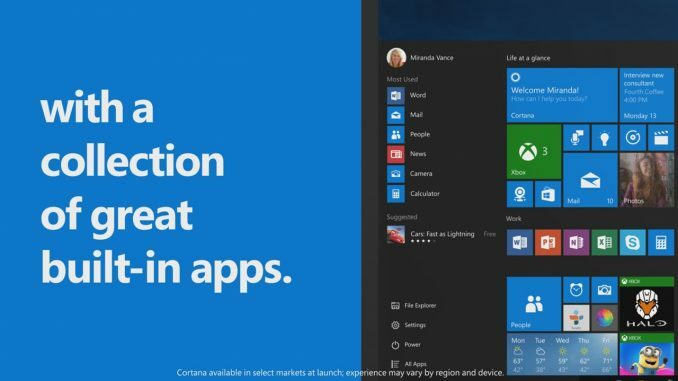 Microsoft is betting users will like the new versions when Windows 10 ships on July 29, 2015 at no cost to users of Windows 7 and Windows 8.1. The upgrade is not automatic: you have to register for it. Users who don’t get a free upgrade have licenses for Enterprise versions of Windows 8.1, XP, Vista and pirate copies, although those licenses could be on the Windows 10 Beta program. I’m betting Windows 10 will be popular but not without a few hiccups. Three of my computers will be upgraded right away. One will stay on Windows 8.1 until the drivers are tested. The app will create albums of your life events, showcasing your best shots to help you tell a great story. With one click of a button you can count on auto-enhance to do expert touch-ups on the photos you take and keep on your Windows 10 device, and rest easy knowing that every photo is safely backed up with a full-resolution copy in your OneDrive online storage. Once your photo has been edited to your liking you can easily share it via email with your friends and family, even set the photo as your lock screen or as your desktop background. The share option allows you to share a specific location with a friend via email or to your OneNote. With the app you get up-to-the-minute traffic information, rich local search results, and robust public transportation options, with new features included like guided turn-by-turn navigation that works even when you’re offline. We’ve also added the Me Tile so you can find your way back home from everywhere. Discover the world in breathtaking hi-fidelity aerial and street-side views, with Maps in Windows 10. Enjoying music and videos is simple, fast and elegant on Windows 10. With Groove you can listen to your favorite songs and artists, make your own playlists, and keep up with all the latest hits. It’s easy to discover new music with radio—custom stations based on artists you love. For ad-free access to millions of tracks with one of the largest music catalogs on the planet, sign up for a Groove Music Pass. Groove is easy to use, portable and personal, with it you get all the music you love, everywhere you want it. With the Movies & TV app, you can browse and play through your own video collection, or kick back to the hottest movies & TV shows in HD. You can import your personal video collection, and play back your content in a fast, elegantly designed app that is optimized for both mouse/keyboard and touch. Browse the Windows Store to rent or purchase from a huge collection of entertainment content, from weekly new releases on movies to TV shows a day after they air. You’ll also find deals, discounts and personalized recommendations just for you right from within the Windows Store. On Windows 10 devices, Xbox and the web, the Movies & TV app lets you start watching a purchased or rented movie on one device and pick up where you left off on another. Simply insert tables, add pictures, use bullets and color to get your points across. Keep up with your inbox with new touch gestures that help you read, sort, and archive your mail. The new navigation bar is quick and convenient, allowing you to move freely between your email and your calendar, making it easy to get things done. You get an experience that’s instantly recognizable with all the great built-in apps in Windows 10. Stay tuned for tomorrow’s post where we’ll be sharing another awesome Windows 10 feature! Will We Admit the Trojan Horse?